The South African book launch of “Karma Kurry” took place in South Africa in the first week of December in Cape Town, Johannesburg and Durban. The guest speakers for the launch events were Ferial Haffajee, Tina Schouw and Ela Ghandi, and the keynote speaker at all of the events was Kumi Naidoo. 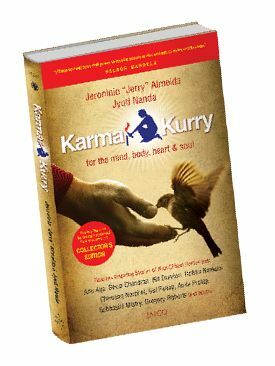 “Karma Kurry”was published in India and is based on the USA “Chicken Soup for the Soul”which features ‘ordinary people doing extra-ordinary things’. Among those features is South Africa’s Kumi Naidoo. The core objective of “Karma Kurry” is to inspire people to find the leader within – to lead not only their themselves and their careers, but also to act for the greater purpose of becoming and leading positive change locally and globally. The chapter on Kumi Naidoo, the former International Executive Director of Greenpeace and a renowned human rights activist, was written by Cornerstone CEO, Noel Daniels. The book was originally launched in India in 2014 to critical acclaim. The public are invited to suggest the title for the South African / African version of the book and to nominate people to feature in the book. Nominations can be done online below, by clicking on the nominate and suggest buttons. To order your copy of Karma Kurry at R200 per book, click on the order button below or send an email to invite@cornerstone.ac.za.